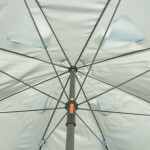 On many beaches, you will find beach umbrellas are as plentiful as the sand. 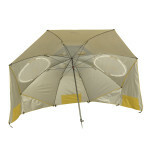 Few of them, however, offer sufficient stability or effective protection against wind and sunlight. 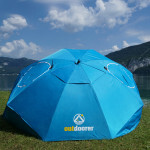 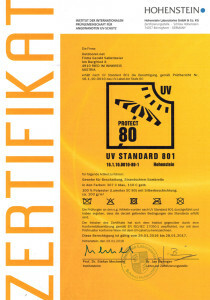 Therefore Outdoorer has developed the Sombrello as a silver-coated Oxford polyester/Lumotex SC 80 umbrella with UV protection. 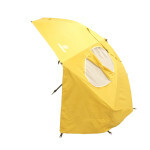 This umbrella tent has the advantage of combining the elegance of a parasol with the comfort and stability of a tent. 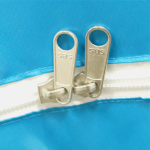 The latter aspect is reinforced by the provided guy ropes and pegs. 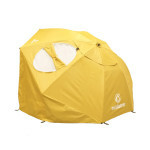 Together with the four triangular air vents, it offers sufficient wind protection, while ensuring good ventilation. 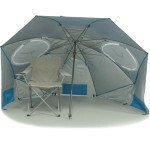 The generous head room also makes it possible to stretch out on a camping chair under the Sombrello and the expansive size offers space and shade for the whole family, who will benefit from UV 80 sun protection. 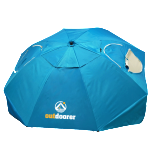 In order to make it possible to watch the beach and the waves while enjoying protection from sun and wind, Outdoorer has built a wide opening into the Sombrello. 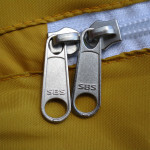 The two unique oval mesh window are each equipped with a high quality SBS brand zip and can be closed from the top and the bottom. 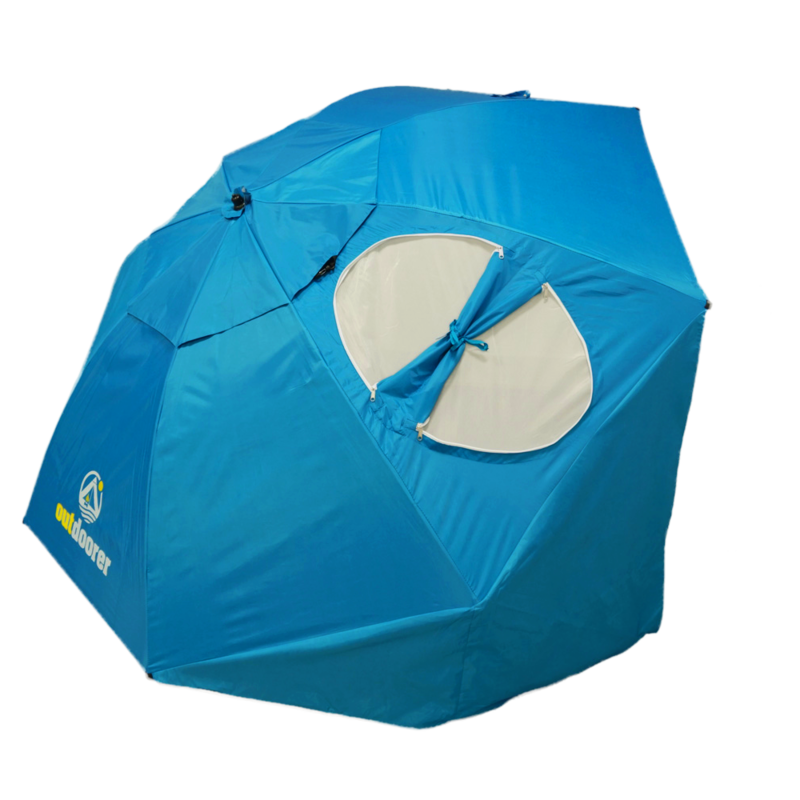 In addition, there are practical interior pockets which can be used to stow the likes of beach towels and sunscreen within this practical beach umbrella. 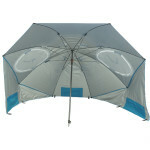 A durable carrying case is also included to provide additional comfort. 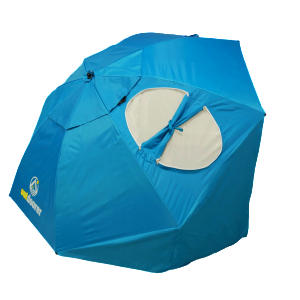 In order to ensure an unforgettable beach experience, we recommend you use our picnic blankets or soft self-inflating camping mats as an underlay. The Sombrello is available in blue or yellow. 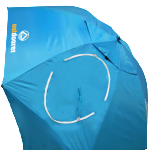 Buy now via Amazon! 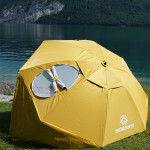 Where can I buy the Sombrello umbrella tent? 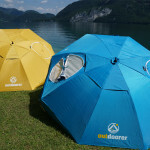 You can buy the parasol Sombrello in blue or yellow at our Amazon shop.